Tomorrow morning I am heading to Laguna Beach, CA for the first ever 2Days With Rob Bell event. 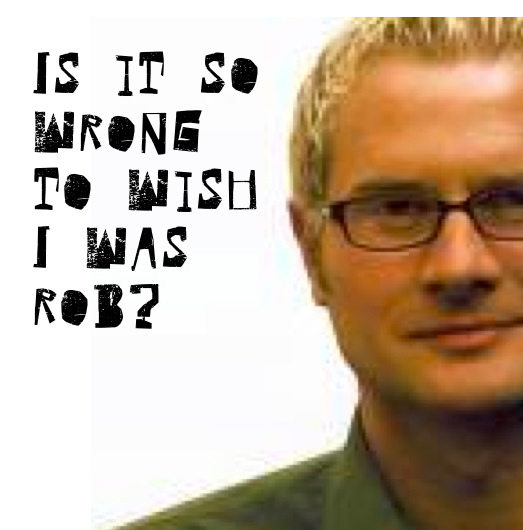 Rob Bell is hosting this intimate conference with only 50 participants, and for once I was Johnny-On-The-Spot and got registered before it filled up. For those of you who are familiar with my fairly open man-crush on Rob, you understand why this opportunity has me geeking out at a pretty high level. All kidding aside, I have been listening to Rob's sermons, reading his books, attending his speaking engagements and learning from him for a very long time. To get the chance to do a small conference like this is a rare privilege, and I hope to get the most out of it. When I attended Rob's Poets, Prophets & Preachers conference a couple of years ago, I left a changed man, and a transformed preacher. I learned more about the creative process of preaching in one weekend than I learned in entire semesters in seminary. 1. How do we feed our own soul when we’re leading and speaking to and giving to so many others? 2. Does the creative process ever get easier? 4. How do we find space to open up and think and breathe deeply when our schedule is so full so often? 5. How do we handle criticism? And does it get any better? and maturity and worldview and yet they’re all part of the same group? Stay tuned for updates and impressions of the event both during and after. leon - i want to get these answers when you get back... details man - details.